The president's unfounded tweet followed a segment on Fox News on the topic on Wednesday night. President Donald Trump on Thursday tweeted a "disproven racial myth" about the killing of white farmers in South Africa to distract from his own problems at home, the former U.S. ambassador to the country charged. Trump — making the claims after a segment on the issue on Fox News — said he had asked Secretary of State Mike Pompeo to study "land and farm seizures" and the "large scale killing of farmers" in South Africa — prompting an angry response from Pretoria accusing the president of stoking racial divisions. The South African government said Trump's tweet was based on "false information" and reflected a "narrow perception which only seeks to divide our nation and reminds us of our colonial past." The government said it would seek clarification of Trump's remarks from the U.S. Embassy. The Trump administration has yet to appoint an ambassador to South Africa, but the previous holder of the post, Patrick Gaspard, accused the president of using the issue of land seizures to distract from his domestic political problems. "The president of the U.S. needs political distractions to turn our gaze away from his criminal cabal, and so he's attacking South Africa with the disproven racial myth of 'large scale killings of farmers,'" Gaspard tweeted. "This man has never visited the continent and has no discernible Africa policy." So what prompted Trump's foray into South African land rights and what was he talking about? The country faces deep racial divisions and inequality nearly a quarter of a century after Nelson Mandela swept to power after apartheid collapsed in 1994. Black South Africans, who make up 80 percent of the population, still own just 4 percent of the land, according to the government. The ruling African National Congress, which has been in power since 1994, has pledged to close that gap, but progress has been slow. It has followed a "willing-seller, willing-buyer" model under which the government buys white-owned farms for redistribution to blacks. 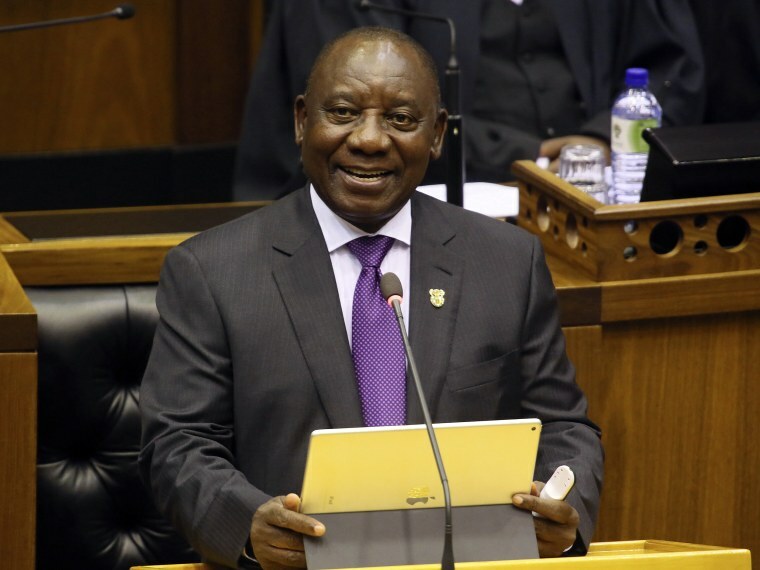 In an effort to speed up land reform, President Cyril Ramaphosa said in July that his government would amend the Constitution so the state could expropriate land without compensation. He has said any measures would be conducted without affecting economic growth or food security, and no land has been seized since the reform plans were announced. The change will allow for the lawful correction of historic injustices, he believes. Before Trump’s tweet, Ramaphosa said land expropriation would begin with state-owned land, not privately held land. However, the prospect has sent panic through some white farming communities that worry the policy will strip farmers of their property, send land values plummeting or make them the target of potentially violent land seizures such as those in neighboring Zimbabwe. Are white farmers being killed? However, experts say that the attacks are in line with the country's high murder rate and that there is no evidence connecting them to victims' race. In 2016-17, there were 74 murders during farm attacks, according to Africa Check, compared to 19,000 murders across the country in the same period. AgriSA, an agricultural industry association, says farm murders are at a 20-year low. And although the majority of farm murder victims are white, the proportion is lower than the rate of white farm ownership, as Africa Check noted in 2013. In fact, "whites are less likely to be murdered than any other race group," it said. Nevertheless, the prospect of compulsory farm seizures is a popular taking point among alt-right commentators and white nationalist websites that describe it as anti-white racism and say farmers are victims of "white genocide." "People are not being targeted because of their race, but because they are vulnerable and isolated on the farms," said Gareth Newham, head of the crime and justice program at the Institute for Security Studies in Pretoria. Julius Malema, leader of the opposition Economic Freedom Fighters party and a longtime proponent of land expropriation, told reporters on Thursday: "There is no white genocide in South Africa. There is black genocide in the USA; black people are killed every day. There is a black genocide here in South Africa; just recently a farmer was convicted for the murder of a black farmer." What prompted Trump to tweet? Trump's tweet followed a segment on Fox News on Wednesday night in which host Tucker Carlson claimed Ramaphosa had already started "seizing land from his own citizens without compensation because they are the wrong skin color," calling the alleged seizures "immoral." Ramaphosa's spokeswoman said Trump had been "misinformed." However, the president's comments were applauded by AfriForum, an organization that mostly represents white South Africans who have described land expropriation as "catastrophic" and traveled to the United States this year to lobby the Senate and other officials. "We welcome it," said deputy CEO Ernst Roets. "I think our lobbying has certainly had an impact because we have spoken with a lot of people who have had contact with President Trump and we have spoken with many think tanks, one of them for example the Cato Institute, which has taken a very strong stance shortly before this statement now by President Trump." "Everyone in South Africa should hope that the pressure from the USA will lead to the (ANC) reconsidering the disastrous route that they want to take South Africa on," AfriForum's CEO Kallie Kriel said Thursday. South Africa's communications minister said Trump's tweet would not affect relations between South Africa and the United States. "The tweet has not determined our approach to the United States on our current relationship and future relationship," Nomvula Mokonyane said after a Cabinet meeting. The U.S. State Department was not immediately available for comment on Trump's tweet.